Picking out a proper gazebo for your backyard can be a tricky process. There are lots to consider from design and aesthetics to size and functionality, all through the delicate balance of price and quality. Particularly worth considering are the so called ‘hardtop gazebos’, which exactly as the name implies, have a hard overtop covering. Today we’re going to review the best hardtops of 2019. A gazebo is a great addition to your backyard life as well as a solid investment into the awesomeness of your home. That being said, however, it can also be a pretty big choice. There are a great many different kinds and styles of gazebos, each with their own pros and cons. A lot of these will carry a sizeable price tag, but there are also plenty of models that are pretty inexpensive. So, what do you go for? Where do you begin? 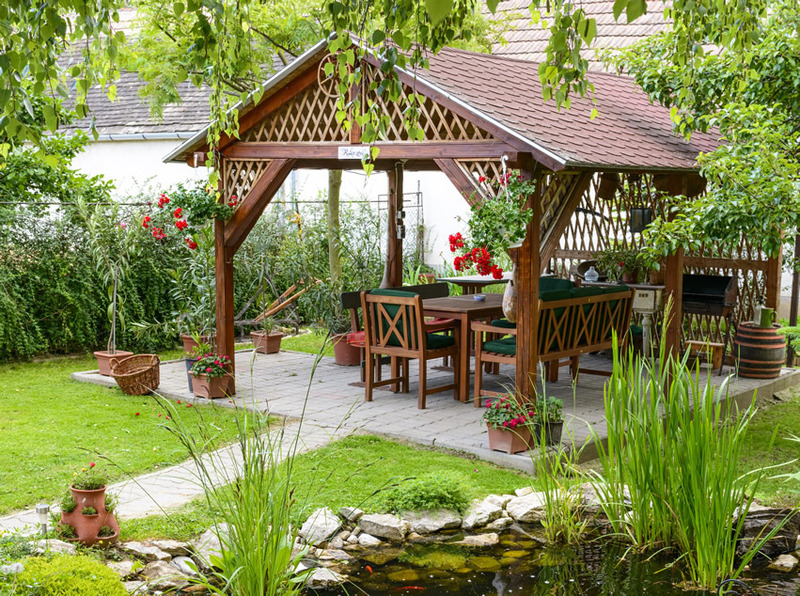 In this guide, we’ll be exploring what you need to know in order to make an informed choice for your gazebo purchase. 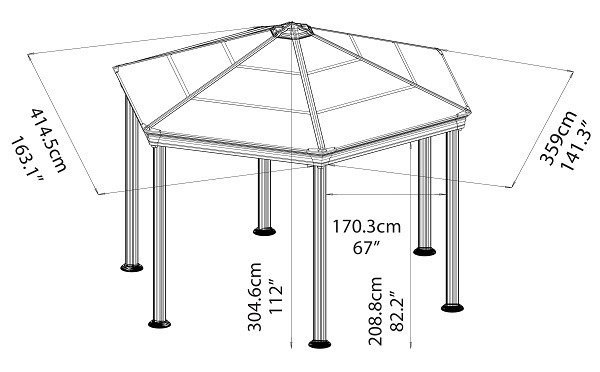 After that, we’ll take a deeper dive into one of the flavours of gazebos out there, namely metal build hardtop gazebos. Uses – As with any buying guide, the very first step is to think about what you are going to be using the gazebo for. What is it that you want to do and what will this gazebo do for you? Hanging Out – The first and obvious choice is creating some kind of chilling spot, be it for yourself, for family, or for guests. With that, come some questions. Are you planning on having a lot of people over and entertaining? Or do you mostly just want a cozy spot to chill in? Perhaps a bit of both? You should think about the number of people and frequency of use. This will help you decide what kind of furniture you will be needing, which in turn will also let you know what size of gazebo you will need. Hot Tub – Still technically a form of hanging out, another use is to set it up over a hot tub. An elegant gazebo encompassing a relaxing hot tub is a great way to turn the ambiance up a notch. Along with that, hot tubs do require shelter from the elements and the sun, so a gazebo is a practical way to achieve that. A gazebo will also protect your hot tub from leaves and other debris that can fall into the water. 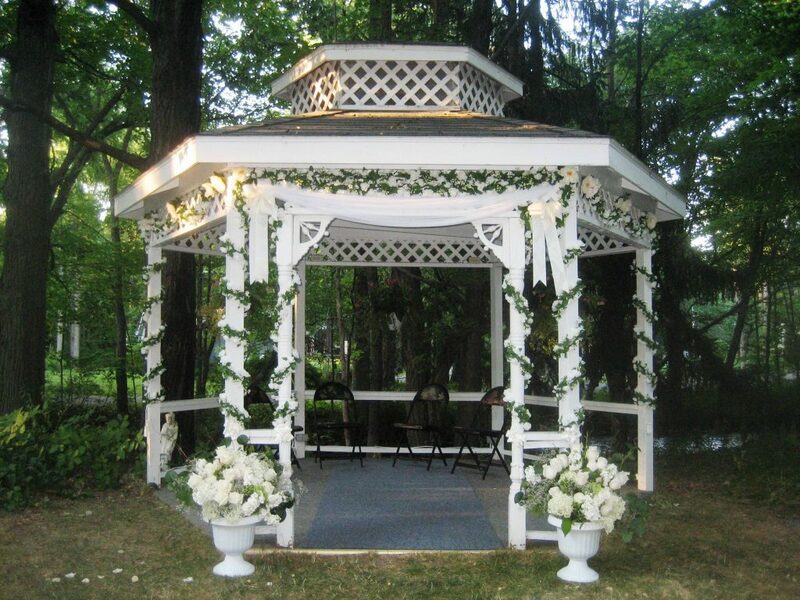 Decor – Let’s not forget that gazebos are excellent for decor. They make your backyard look boss. They can work as either a centrepiece, or as a functioning part of the larger whole that is your yard. 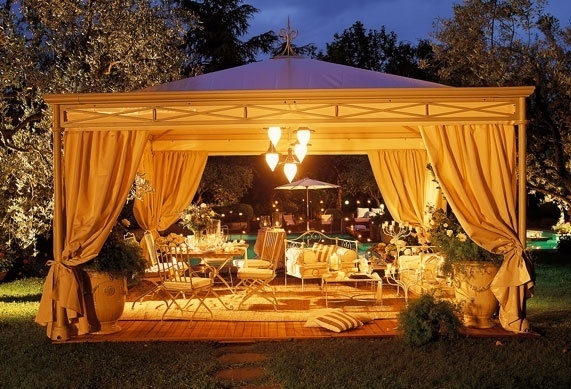 Different types of gazebos will have different decor advantages. Soft tops are great because the canopies come in a variety of colours, be it vivid and bright, or more neutral. Not only that, but it’s usually easy to chance the canopy on soft top gazebos, so you can switch it up if you so please. The advantage of hard tops, however, is the sleeker look of the material and finishes. They usually come in dark neutral tones, so they are also easy to match with the rest of your yard regardless of how you set it up. An interesting thing to point out about wooden gazebos is the fact that you can match the shingles on the gazebo to the shingles on your house. Barbecuing – Barbecuing is a bit of a discussion. There are a lot of times when you might want to get your grill on while hanging out in the gazebo. It’s not surprising a lot of people are wondering if you can barbecue under a gazebo. The short answer is yes, but only certain types of gazebos are suitable for that. It’s very important to avoid grilling under any other type of gazebo, especially soft tops. We’ll elaborate on this later on. Our lineup also includes the Harper Grilling Gazebo, which is designed to be safe for barbecuing. Placement – Where is the gazebo going? You should check how much room you have in your yard and see what the best positioning and coverage area should be. This will tell you what size of gazebo to go for. A rookie mistake is to find a spot that technically fits but is a tight squeeze. As far as the layout of your backyard goes, you definitely don’t want the gazebo to overpower everything. It does well if it’s a centrepiece, or if it just blends with the rest of your stuff. However, if it overshadows everything, then it will throw your entire backyard off balance. This will also complicate your life when it comes to setting it up or tearing it down, as well as trying to access it during regular use. The bottom line here, is you need a gazebo that is sized to fit comfortably in your yard, not one that can barely squeeze in. Lastly, you should keep in mind that measurements provided by manufacturers are usually measurements of the base, not the canopy. This means that if the canopy stretches beyond the posts, any amount of overhang is ignored by the measurements (ie it’s realistically a little bit wider and longer than the specified dimensions). Material – The material that a gazebo is made from, as well as its size when fully built, will determine its strengths and weaknesses. Depending on your intended use, you have a two different avenues to take: hardtop or soft top. Traditionally, gazebos have been built from wood. Nowadays, while wooden gazebos are still very much an option, you can also have your pick of modern builds that are made from metal, polycarbonate, or plastic. Wooden Gazebos – Wooden gazebo kits carry that charm and traditional aesthetic which makes them quite popular. They offer a lot to their owners, however, they are more involved to set up and also require more ongoing maintenance. For installation, the kit will give you all the parts, but you will have to build the whole wooden structure from the ground up. For maintenance, the wood will need a bit more attention as well as more preparation for the cold season. That being said, some people love to get into a gazebo building project, so if you want to roll up your sleeves, this may be the route for you. Wooden gazebos will almost always be hardtops, the only exception perhaps being pergolas, but that is more of a technicality. 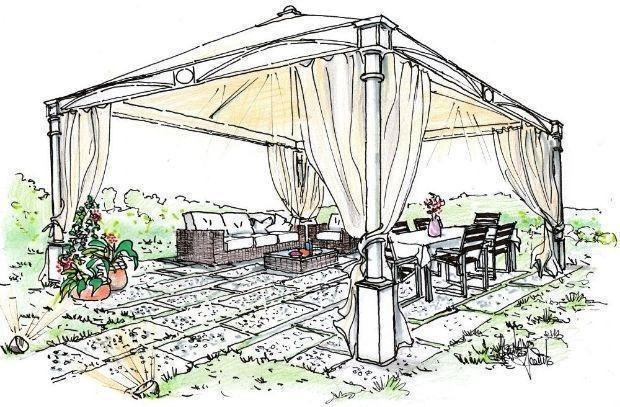 You can get kits for either regular gazebos or for pergolas. Non-Wooden Gazebos – Non-wooden gazebos will still have some setup and maintenance involved, but not as much. Usually all you have to do is assemble the components and screw them in place. The amount of setup involved depends on the size and weight of the gazebo you’re getting. Naturally, heavier builds will need a bit more effort than lighter ones. Non-wood gazebos offer more choice than the wooden ones, letting you choose between more styles, designs, as well as prices. The main choice to make is whether you want to go hard top or soft top. Soft Top Gazebos – Soft tops are on the lighter end of the spectrum. A soft top gazebo is a gazebo where the canopy is made from fabric. The soft tops themselves can come in various sizes, and their frames can be more or less sturdy depending on the model. Across the board, however, soft tops are great because of their versatility. They are a lot easier to set up, tear down, or move. They also offer a lot of variety in terms of colours of canopies and other design features. Last but not least, they are more affordable than hard tops. This all, however, comes at the cost of durability and longevity. They typically don’t last as long, and they are not fit to be out during the cold months or in very bad weather. Depending on the soft top that you get, some will be sturdier than others, but there is a limit to how much they can withstand. The sturdier ones will also be more expensive. Hard Top Gazebos – A hardtop gazebo, as the name would suggest, is a gazebo with a solid roof. Hard tops are on the heavyweight side. They will require more love than the soft tops, but they will also reward you more. They are much more durable against the elements, and with proper care, most models will be able to withstand all seasons. Aside from durability, they also offer much in the way of size and design. They come in larger sizes to create more coverage, and a lot of people will also agree that the finishes on hardtops are more pleasing (since soft tops can often be associated with tents, which is a different kind of vibe). The Main Trade-Off – At the end of the day, the main trade-off has to do with how sturdy, heavy, and big you want your gazebo to be. Bigger will mean better quality and longer lifespan, however, this comes at the sacrifice of price and versatility. Smaller and lighter means it will be easier to work with and more flexible when it comes to set up and moving. It will also be better on your budget. However, the cost for that is durability. Buying Guide Wrap-Up – That’s it for our crash course on how to pick a gazebo. For this guide going forward, we’ll be focusing on metal hardtop gazebos. We’ll be going into detail about why they’re great, as well as everything you need to know to get the most out of them. Let’s dive in! Your gazebo is here! (Or at least it might be on the way!) You are going to need to prepare for the setup. Quick recap, as mentioned, the hardtops require some time investment to get them set up. The good news is that it’s all just assembling parts and screwing them together. There will, however, be some heavy lifting involved and you will need another person to help you. At the same time, by this point you should have a spot designated for your gazebo to go into. Be sure to not make it too tight of a fit. 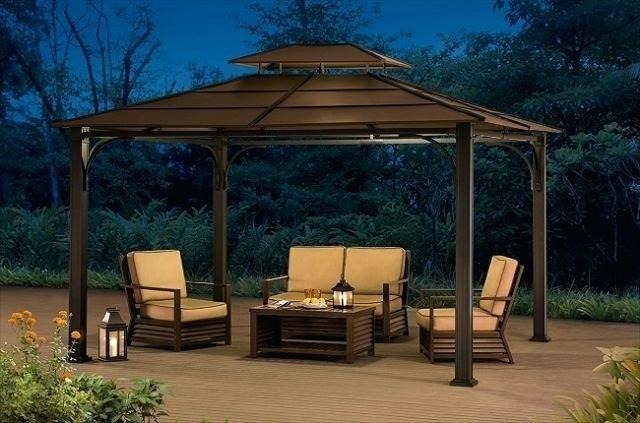 This is because you need room for accessibility and usually any overhangs the gazebo might have are not included in the manufacturer’s dimensions. When assembling, you should set it in position first and proceed to assemble it in the spot that you want it to be. Moving a hardtop around after install is close to impossible, so you definitely don’t want to end up doing that. What to Expect – Hardtops are heavy. They easily total around 500-600 lbs, and the canopy alone can weigh as much as 300 lbs. There will be a few points where you will need a second person to help with positioning and lifting. This is at the bare minimum, if you can get more help than that, then great. It’s not recommended to try to set it up entirely by yourself. If you’re working at a healthy pace, the whole process should take about 4-5 hours. Makes for a good Sunday afternoon project. Last but not least, you will have lots of parts as well as nuts, bolts, washers, connectors, and so on. It’s super important to stay organized and to keep everything separated and categorized. It will make you life a whole lot easier. Setting Up – Alright, it’s time get down to business. First thing to do is, obviously, to unpack the box that it all comes in and sort through the different parts. Take everything out of the box, and try to spread it out around where you’re going to be installing the gazebo. Sort all the parts by type, so you can have all your posts in one place, all your beams together, and so on. Do the same for all the nuts and bolts. It’s a good idea to not open any of the packages of nuts and bolts until you actually need to use them. Opening these up ahead of time is a recipe for spilling or losing them. For larger parts, on the other hand, it’s convenient to unwrap them ahead of time. The important thing overall about this step is staying organized. It cannot be stressed enough that there will be a lot of parts, and exponentially more screws and bolts, which means that if you don’t stay organized, your afternoon will very quickly go downhill. That being said, if you stay organized and follow the steps, then it should be fairly smooth sailing.After the initial prep, it’s all about following the instructions in the manual and connecting all of the individual parts using whatever bolts or connectors are required. You should think of it as two parts, the legs and the canopy. This gives you two choices when it comes to assembly. You can fully assemble the legs, then fully assemble the canopy on the ground, followed by lifting up the canopy onto the legs. The only thing left after that is to tighten and secure the canopy on the legs. You will need the help of at least one more person since hardtop canopies can weigh up to 300 lbs and they will need to be lifted up pretty high onto the legs. The alternative to this set up is to only partially assemble the canopy. Still start by fully assembling the legs and getting them ready for the canopy. In this case, you can get away with only assembling the frame for the canopy, without any of the ceiling panels. You should also leave the bolts fairly loose for flexibility. This strategy comes with one additional requirement and that is a ladder. This is so that you can get up to tighten the canopy and slide the roof panels in. You will still need the help of at least one more person by your side. This time it’s so that they can pass you the panels while you’re up on the ladder (or vice versa). 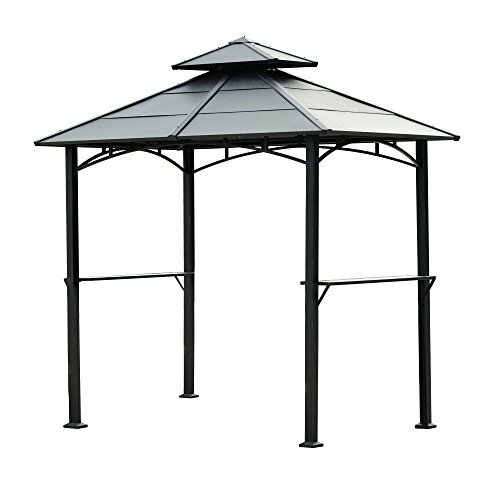 Hardtop gazebos are luckily pretty straightforward and durable structures, so there isn’t too much that can go wrong. That being said, it’s not completely out of the question, so it’s good to be prepared. As you now know from the installation section earlier, hardtop gazebos are a whole bunch of individual parts assembled together. This means that if anything in particular is acting up, you can always take it out and replace it, which makes it pretty friendly for maintenance. The most common thing that could go wrong is the roof. It is exposed to the most hardship as far as the elements are concerned. If you notice a leak or damaged roof panels, just replace the panel that is leaking. You should also check if it has been displaced and needs to be secured better (it could be that it just needs tightening). Same applies for the legs or any other part of the frame. Inspect the area if anything looks amiss, try tightening and re-securing to see if that helps, and if not, try replacing the part. Hardtop gazebos lend themselves well to accessorizing. Some even come with a few accessories straight from the manufacturer. 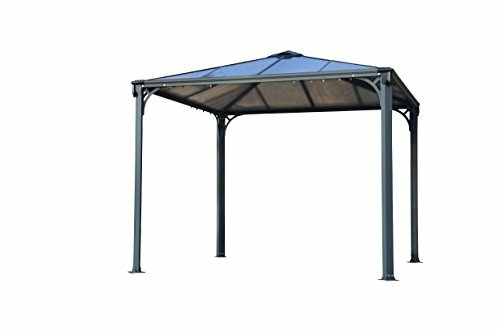 Let’s see what are some options when it comes to gazebo accessories. Curtains – Curtains are the first thing that comes to mind. A lot of models will either come with curtains or have railings that you can clip curtains to. Curtains are great for adding a bit of style and also a bit of privacy. Screens and Dividers – Still on the same topic as curtains, there are screens. Privacy screens and dividers are like walls to your gazebo and go a step further in outlining and protecting your hangout space. Screens are also a lot more effective when it comes to keeping bugs out. Lights – It’s hard to go wrong when it comes to gazebos and lights. You can set up a few lights just for practical illumination, or you can go full out with decorative LEDs and the sorts. 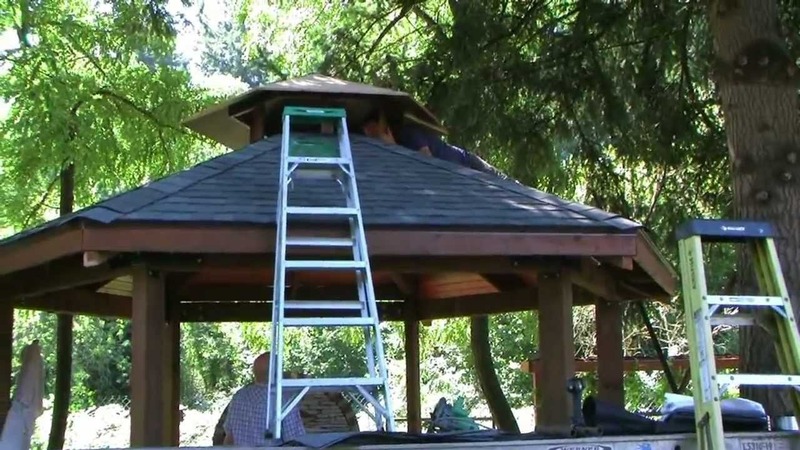 Just about any kind of light will work on a hardtop gazebo, so you can just have at it. The only things you need to watch out for are power cables (so they are not hanging out of weird places or becoming trip hazards) and incandescent bulbs (as they can get pretty hot). It’s really not recommended to use incandescent bulbs under small gazebos or under soft top gazebos as it can be a fire hazard. At the end of the day, if you can keep it to LEDs (and battery powered, where possible), that would be the best way to go. Covers – Hardtop gazebos can stay out during the winter or during less-than-friendly weather. They are wonderful for holding up against the elements. However, this doesn’t mean they don’t need a bit of care and protection. Covers are great for the wintertime. Simply throw it on top of your gazebo when the seasons change and just make sure to clear snow and ice routinely so they don’t pile up. Removal for hardtop gazebos works about the same way as the setup. You will need to start unscrewing and disassembling all of the parts one by one. Similar to installation, bring over all of your packaging and a few separate containers for all the nuts and bolts. If you have any of the original packaging, then great. Start from the top down. Start by removing the roof panels, then uninstalling the canopy. Finally work through the frame and the legs. Be sure to put all parts away neatly, sorting them by type. For any kinds of nuts, bolts, and connectors, try putting them in separate containers by type. Same as with installation, it’s very important to stay organized as it will make your life a whole bunch easier. One cool thing you can do with a gazebo is set up a hot tub underneath. In fact, in many ways gazebos and hot tubs are made for each other. What better way to step up your hanging out game (or entertaining game), than by jumping into a nice steamy hot tub. The gazebo enclosure also adds a lot in terms of ambience and privacy when it comes to lounging in a hot tub. Beyond that, there are some important practical advantages as well. Hot tubs need to be sheltered in order to function properly and last their full lifespan. They need to be protected from the elements, including overexposure to the sun, as well as debris and leaves that might fall from trees. This can make finding the right placement for a hot tub tricky at times. However, a gazebo is an effective way to provide shelter for your tub. One thing a lot of people wonder is, can you barbecue under a gazebo? Naturally, it’s something that comes to mind. You’re hanging out, you’d probably like to grab a bite. Why not fire up the grill? Similarly, if you’re really wanting some barbecue but the weather isn’t the most cooperative, you might find yourself tempted to do some barbecuing under the shelter of a gazebo. This one is an interesting topic because there is some debate going on. Some people say it’s not at all a good idea, others say that you might be able to get away with it if you follow certain steps. From what we have seen, when it comes to regular hardtop gazebos, one really shouldn’t try to grill under them. Emphasis on ‘regular’, in this case. You will see why when we discuss grilling gazebos later on. An unventilated enclosure over a barbecue or grill will create a serious fire hazard. If you are lucky and the canopy does not immediately go up in flames, you are still on your way to having a bad time. The heat and smoke can easily damage your gazebo, and the proximity to the grill is an effective way to smoke out your guests. Don’t even get us started about curtains. With that said though, there is a handy solution to all of the above. 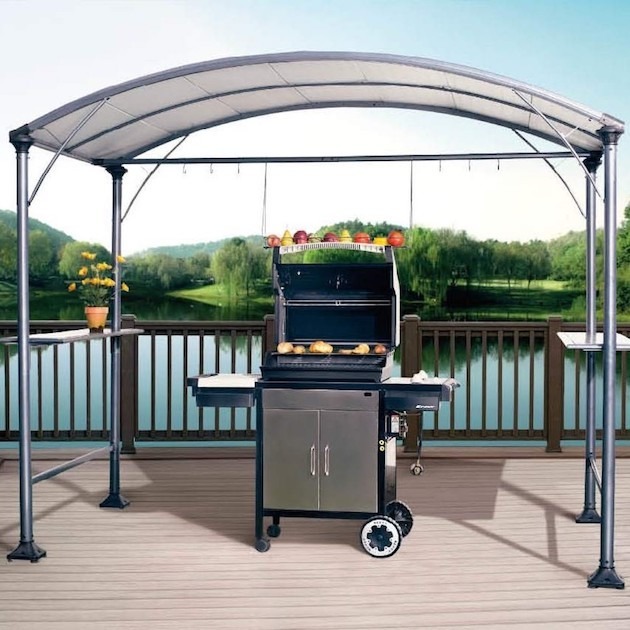 There are some models of hardtop gazebos designed for grilling. We actually feature one in our lineup, namely the Harper Grilling Gazebo. Grilling gazebos are designed especially for barbecuing and cooking. They have two important features. The vented roof allows for smoke and heat to be funneled out. They are also typically smaller. This means that only the cook and the grill can fit underneath. The size makes it so that you can only use them for this purpose, so you are not mixing in guests and furniture with the cooking process. This is handy because it helps keep the fire away from people or anything flammable, while also allowing the cook to focus on the topic at hand – cooking. If you don’t want to compromise on being able to hang out underneath a gazebo, it’s possible to get a separate gazebo for grilling (since the Harper model is smaller). This way you can have a gazebo to cook your food in, and a gazebo to serve and enjoy that food with your guests. Best of both worlds! While you might not be thinking about the weather, you’re going to need to consider the kind of structure that will survive outdoors. Not everyone needs a gazebo that can withstand inches of snow each year. Your winters might include heavy rains or other weather elements. Your harsh weather might be the summer where you’ll need a gazebo that will protect you from UV rays. Some polycarbonate structures allow the light to filter through without the damaging rays of the sun. Either way, if unfriendly weather is approaching, and it’s looking like it’s time to retire the gazebo for a few months, it’s always a good idea to put a cover on. They’re relatively inexpensive and will help keep your gazebo safe. In addition to covers, you should make sure to brush off snow and ice regularly. Ice buildup or heavy snow piling on top of the roof can cause serious damage. All this can be avoided if you simply take a few moments to brush it off regularly. 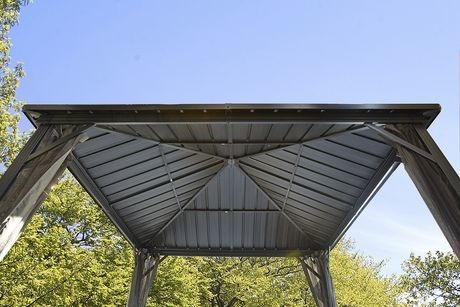 The Sojag Messina Gazebo Sun Shelter is one of the most stunning out there. If you are looking for nothing short of luxury and excellence, look no further. The 12 by 16 foot build allows for quite the spacious layout, however, it does so without being too difficult to work with. Totalling at 192 square feet, it’s perfect for setting up a full dining table with chairs along with some cozy lounging furniture. It does a great job at fitting a dining set along with two lounge chairs and a loveseat on top of it all too. Before you even know it, this gazebo is all set up to be a dining room as well as a living room. Put all your plans on hold and let’s get some guests over! Let’s take a look at some of the beautiful features included with the Messina hardtop gazebo / sun shelter. First thing you’ll notice is the very well designed finish. It comes in an elegant dark hue, but it isn’t fully black. The polycarbonate hardtop gazebo with aluminium build will always come in darker colours for these types of gazebos, however, Sojag definitely nailed the finish making it a shade that is easy to pair with any decor, while proudly popping and standing out as a centrepiece in your backyard. As we’ve discussed in our buyer’s guide, the proper roof design and whether it has proper ventilation or not, can really make or break your gazebo experience. Vents are critical in a gazebo design because it prevents them from turning into accidental greenhouses. While we all enjoy a good dose of summer heat, we definitely don’t want to be sweating profusely while trying to recline in the backyard. The vents are built in specifically for that purpose and make the air circulation just right. 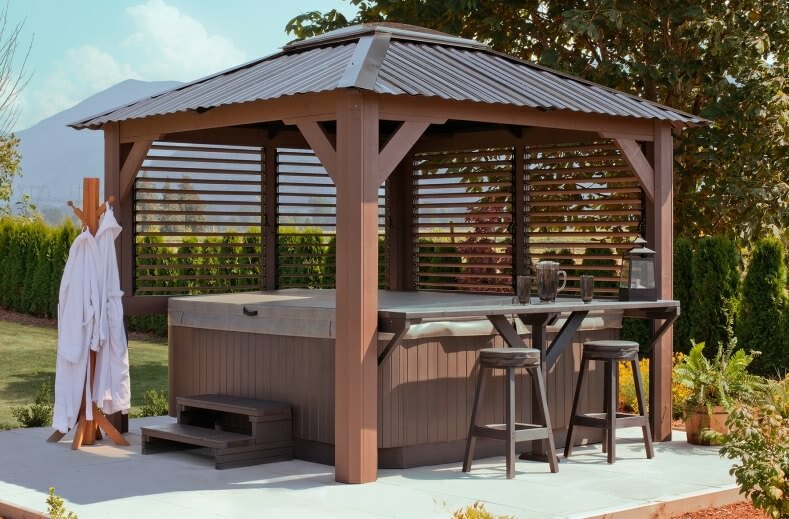 Additionally, the Messina comes with a slanted roof design that helps rainwater trickle down easy without the hassle of it pooling and having to be cleared out from the roof of your gazebo. This way you can have a great experience no matter the weather. Rain or shine, this gazebo has got you covered! The next important feature is the included mosquito net. 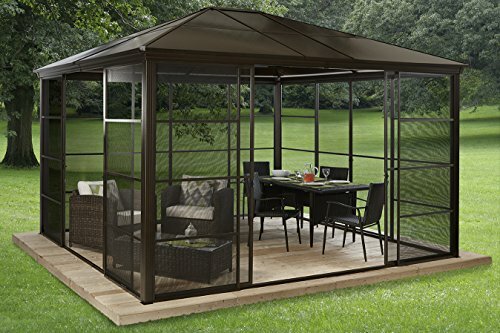 As discussed, there are many ways to protect yourself from invading hordes of mosquitos trying to ruin your fun, however this gazebo takes care of all that for you. The elegant and oh so effective mosquito net is sure to keep out any insects that might want to bother you or your guests. Finally, all of the above wouldn’t go too far if it wasn’t properly weatherproofed. Because it will be diligently sheltering you from the elements, it only makes sense that it needs to be properly equipped to handle it. Without a doubt, the Messina hardtop gazebo is designed to be especially durable, and also comes with extra reinforcement against rust. Now, before being able to sit back and enjoy your gazebo, it will require a bit of setup. Sadly, because they are such large products, there are no gazebos out there that simply come ready out of the box. Every gazebo will require some assembly. Fear not, however, because the Messina design lends itself to very easy and straightforward installation, thus making sure that there is as little as possible standing between you and your relaxing day in the backyard. To wrap it all up, you might ask “is the Messina hardtop gazebo right for me?” Well, let’s take a quick look. 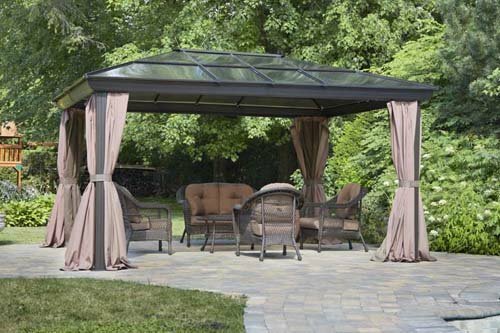 All in all, the Messina hardtop gazebo is designed for those who really enjoy the extra space. If you have a family, like to frequently entertain guests, or just really like reclining in a very spacious environment, then shop no more. At the same time, if you are like us and are picky about quality and durability, this gazebo is sure to deliver on its promises. It has a very stylish and elegant build that is also rugged and durable. Indeed, our research shows that customers can expect to enjoy this product anywhere from 5 years to up to 20 years with proper care and maintenance. Truly a hard bargain to overlook! 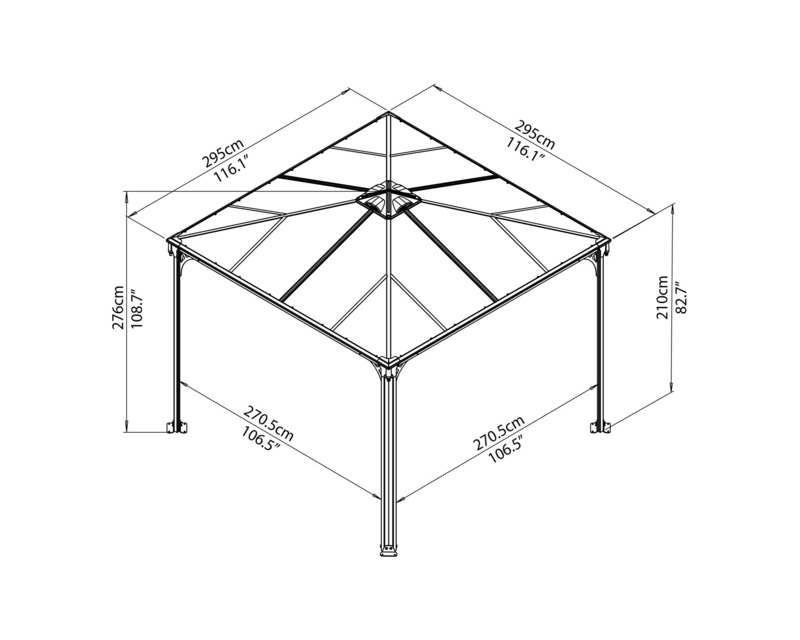 Next in our top lineup is the Palram Palermo 3000 hardtop gazebo. This one is a change of pace from the Messina, being designed to be extra compact and space-efficient. The 10×10 design isn’t as spacious as the 12×16, however, a large gazebo might not be what you need depending on the layout of your backyard. Clocking in at 100 square feet and able to easily host a table and four chairs, the Palermo 3000 hardtop gazebo is a beautifully space-effective and versatile centrepiece. If you’re looking for something more compact, but an equally stylish and quality build, then this gazebo might be just right for you. 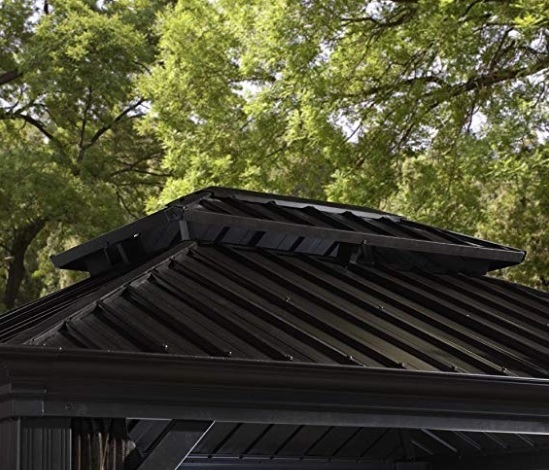 Taking a look at the features, the first thing you’ll notice is the dazzling polycarbonate roof. Not only is it stylish and durable, but also much more effective at sheltering you from the heat and sun. Most hardtop gazebos are made from aluminum which can allow heat to build up, however, the Palermo 3000’s roof lets light shine through while blocking out UV rays. This lets you get some much needed sun without overheating and also reduces your risk of sunburn. Adding to the intriguing design, this gazebo has built in fixtures to help hang lights and plants. This sets it apart from most gazebos as they usually do not come with any hanging systems, making it very easy to light up and decorate without taking up extra space. In terms of functionality the Palermo 3000 cannot be beat. Unlike most gazebos, this one comes with a so-called anchor kit which makes it extra sturdy and allows it to withstand gusts of wind or less than perfect ground much better. This is coupled with a very easy to assemble design which is praised for its straightforwardness because you will not need any tools to set it up and you can effortlessly do it all by yourself (a feat which is difficult to accomplish with most gazebos, especially the larger types). All in all, this is all also covered by one of the best warranties in the industry. While most manufacturers can give you anywhere between one and five years, the Palermo 3000 hardtop gazebo is covered for up to ten full years. Definitely a worthwhile purchase in our books! 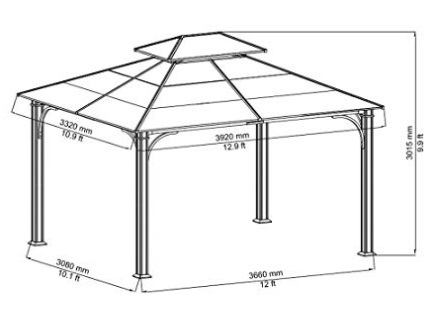 The only thing to consider for this gazebo is the sizing and whether that will work out for you. Don’t get us wrong, this tiny champion does more than most gazebos and will certainly go a long way. However, the 10 by 10 feet can be a little small if you are part of a large family or are having a large number of people over. Overall, this gazebo will work great for up to four people. 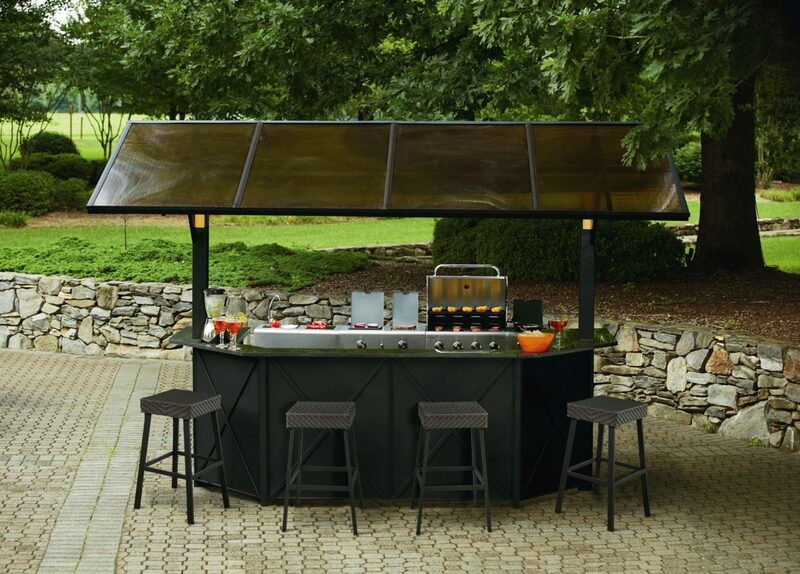 The compact design makes it easy to work with and to integrate in any backyard. On the other hand, if you are expecting to hang out with more than four people, some of the larger hardtops in this lineup might be better suited for you. 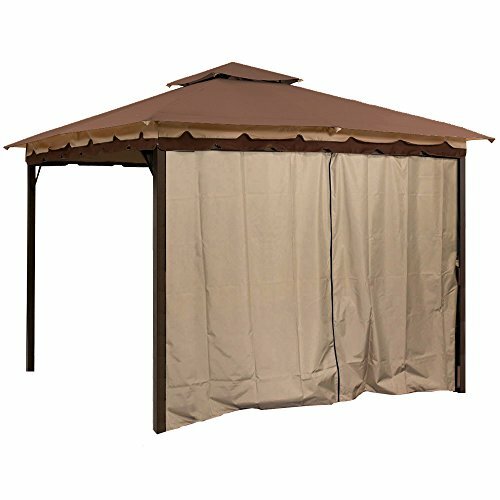 The Castel Hardtop Bronze Gazebo is truly one to take it to the next level in the world of backyard entertainment. We’ve talked a lot about the benefits of a stable and sturdy hardtop, but what about solid panelling all around? Indeed, the Castel Bronze Hardtop does not mess around and actually comes with full scale sliding screen doors. It simply screams of luxury and elegance, while being uncompromising in functionality. Most gazebos would come with netting or curtains, but this is something else. The Castel allows you to recline worry free in nothing less than a stylish room set up in the middle of your backyard. The screen doors protect you from insects and the elements without getting in the way of the beautiful view and sunshine around you. This is complemented very nicely by the tinted roof which allows some light in without making it overwhelming. At the same time, should you grow tired of the screen doors, they are easily removable so you can switch to a more standard hardtop design. In case you were wondering if this gazebo got any more versatile, we are here to say that it certainly does. The doors and panelling come with screens which allow you to either close it up to keep the temperature steady, or you can leave it open with the screens up to allow for more air circulation. The screens keep bugs out while keeping the gazebo nice and breezy, simple as that! The next thing you will notice is that the finish on this item is absolutely stunning. It’s coated in bronze for a stylish and durable design which will be the envy of everyone that comes across it. This does make it a bit on the pricier side, but review, after review, after review, on this product says that you will not be disappointed. Further on the functionality front, while it is one of the larger gazebos, it does not require too extensive of an assembly. It will require some installation to get it up in place, however, it is nothing that will require specialized tools or too much technical know-how. One person can definitely pull it off, but two people might have the easiest time doing it. The best part is that, once it’s up, it can stay up as long as you please because this one is all season. Indeed, this gazebo can withstand all of the elements season-round. The bronze coating makes it particularly resistant to rust and temperature changes, meaning that you don’t have to worry about it being out during the winter. 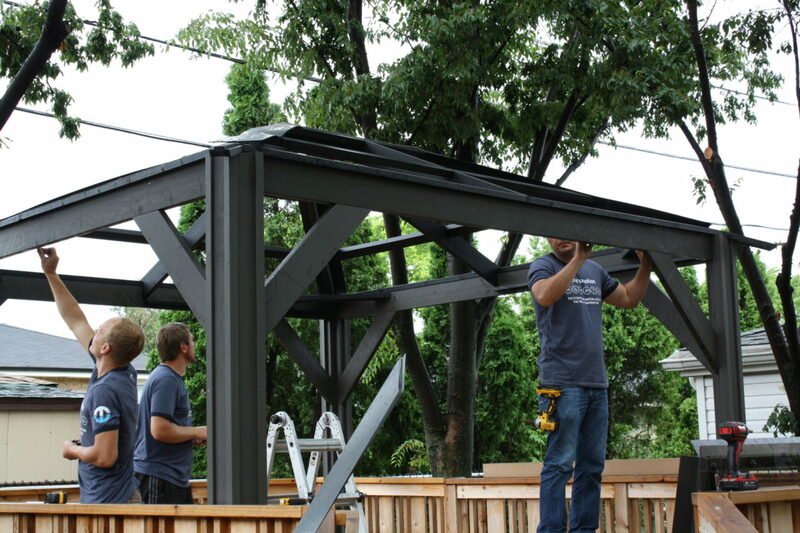 Up next in our lineup is the wonderful Chatham Steel Gazebo. Coming it at a perfectly moderate size of 10 by 12 feet, this item will absolutely dazzle you with it’s feature loaded design. The aesthetics and overall look are gorgeous. 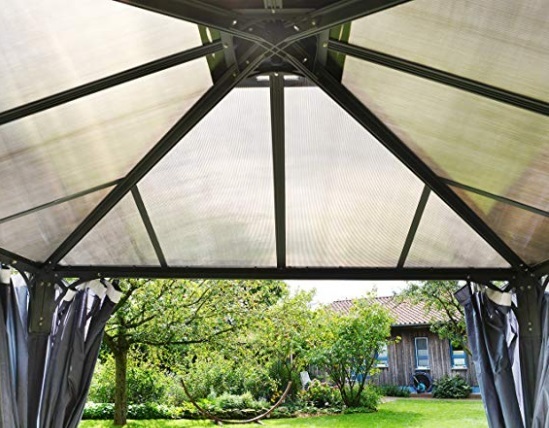 It features an opaque roof which is perfect for shade and has a very sturdy weather resistant build. Not only is it resistant to weather and rust, it is especially designed to endure moisture, making it the perfect candidate for placing over a hot tub. 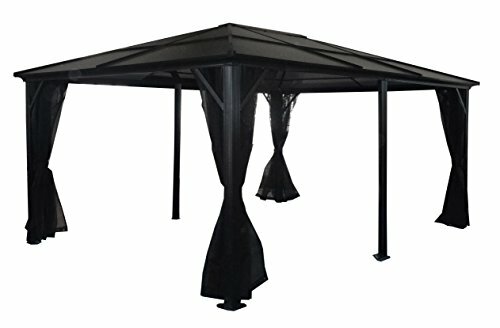 If you have ever wanted a splendid canopy above your hot tub, this is the gazebo to do it with as it will not rust or let you down. Aside from that, should you wish to go the traditional route, the spacious yet not oversized design will let you comfortably fit in up to three chairs or a couple of chairs and a loveseat. In fact, it gives you a little more to work with because of the particularly high clearing. The Sunjoy Chatham is a lot taller than most models meaning that your taller friends and relatives will never have the hassle of bumping into the ceiling. All in all, it has our vote as one of the most well rounded gazebos as it boasts endurance coupled with impressive style and design, while also being very fairly priced. 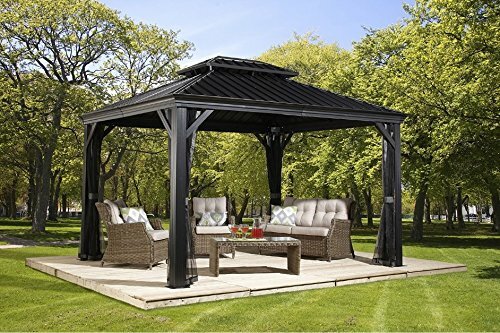 Indeed, given all the Chatham Steel Gazebo has to offer, it retails very close to the budget friendly variety despite not looking nor feeling like it at all. Another champion of the mid-sized gazebos, the Sojag 500 Meridien Charcoal Aluminium Hardtop Gazebo takes it a stretch further. While most common mid-sized hardtop gazebos are ranking in at 10 by 12 feet, this one takes it up a notch to 10 by 14 feet. While it doesn’t seem much of a difference, the extra 20 square feet truly make it feel a lot more breathable and spacious. Not only does the extra square footage make it feel more comfy, it usually makes the difference between getting in that extra piece of furniture to complete the set. Have you ever tried to arrange a room or a gazebo and found that you were short just a few feet? This is exactly why the makers of the Meridien opted to have the extra 20 square feet. It’s because they know a small improvement in the right place can make all the difference. At the same time, the marginal increase does not at all make it difficult to work with and there is no change in price despite the fact that you’re getting a little more. Taking a look at the features of the Meridien we’ll notice more than a few neat things. The roof is of the see-through variety. It allows sunlight to light it up while also blocking out UV rays, therefore reducing risk of sunburn and overheating. It comes with a netting to protect you from mosquitos and it happens to be particularly fancy. 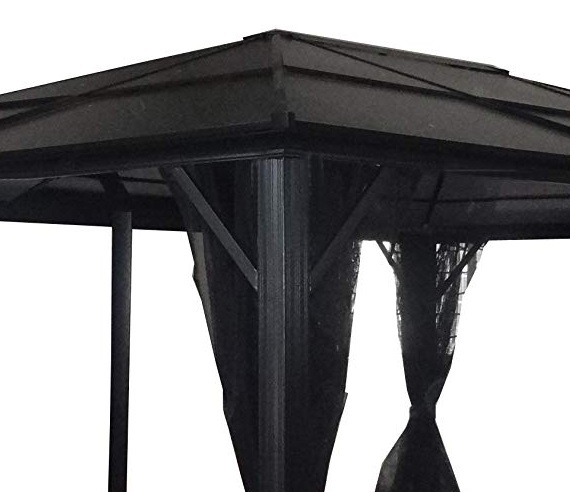 While mosquito netting overall is a great feature to have and is often a trademark of higher end gazebos, they can become unwieldy from time to time. Despite making an appearance on a higher end product, the nets themselves might not be of the highest quality, or might be hard to work with. In the case of the Meridien, they are absolutely flawless. In fact, they almost feel like draperies. In the durability department, this gazebo certainly over-performs. It is a particularly high-endurance build which is made to last through all seasons. 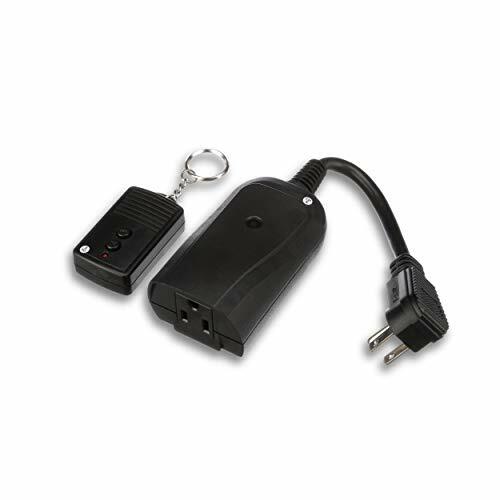 This means you can have it set up year-round without having to worry. On top of that, it comes with a killer warranty that has you covered for up to ten years. If you’re planning on making a long-term investment in a product that will not let you down, you have all you need in the Meridien. 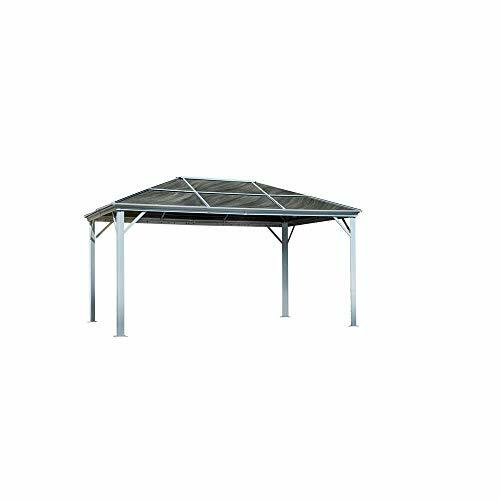 On a final note, the Sojag Meridien Charcoal Aluminium Hardtop Gazebo is also designed to be easy and straightforward to assemble. Always keep in mind that gazebos of all shapes and sizes will require some work to properly install, however, that doesn’t mean it needs to be a hassle and a half. While some effort can’t be avoided, it’s certainly worthwhile to look at models that lend themselves to easier assembly. Up next in our lineup is the Gazebo Penguin hardtop. 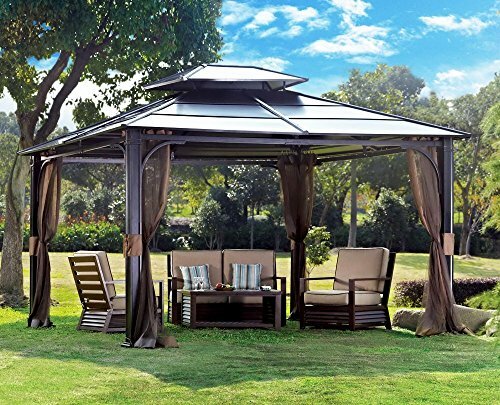 So far we’ve reviewed gazebos of different shapes and sizes, with an assortment of features, however this one made it into our ranks for being simply huge. 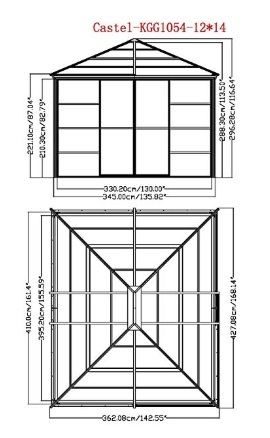 The absolutely luxurious 12 by 16 feet ensemble totals at 192 square feet and is perfect for those who really want a large indulgent patio. Whether you’re having a lot of people over, or simply want to decorate it with all the best reclining furniture, the Gazebo Penguin is ready to take on whatever layout you have in mind. At the same time, one would easily expect that the larger sized high end hardtop gazebos are quite a bit more expensive. That is usually true, however the Gazebo Penguin defeats the odds by being luxuriously large while maintaining a very moderate price. The impressive size, coupled with excellent pricing make it a product that is difficult to overlook. Let’s take a look at some of the features. Like several other selections in our listing, it features the gorgeous see-through ceiling, which as mentioned above, will let some sunshine in while blocking out the UV rays. This way you get to enjoy some sun and sky without worrying about overheating or catching a bad sunburn. 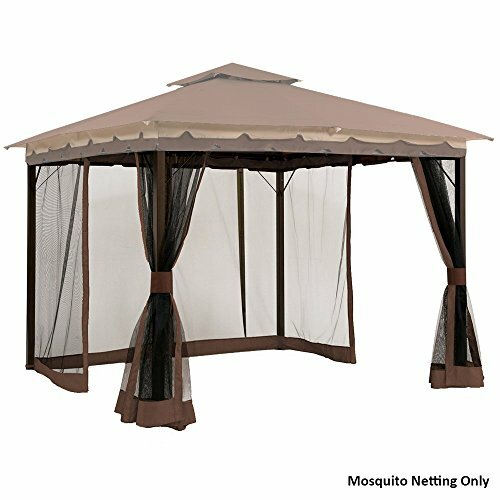 As far as the accessories are concerned, this hardtop gazebo comes with some very beautiful curtains to keep out the mosquitos or to provide some extra shade if needed. The curtains for the Gazebo Penguin actually come in a variety of colours and you can order additional ones separately if you want to change them up. 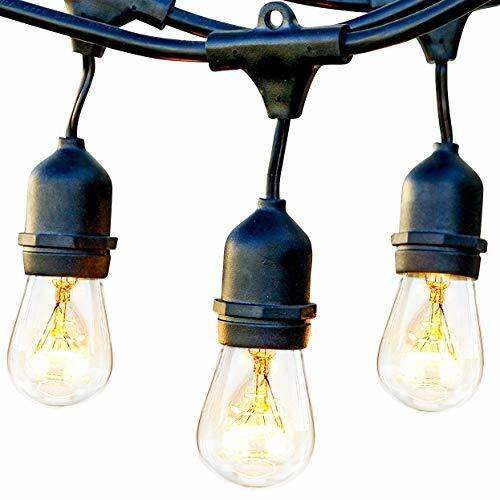 At the same time, it sports some handy hanging systems which are absolutely great for hanging plants and/or lighting to decorate the interior of your gazebo. 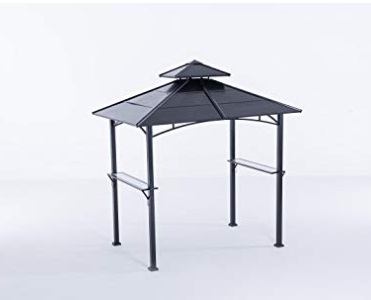 Like we’ve said before, this is not something that comes as a default with many gazebos and is very useful for both decorating and space management. In terms of the physical functionality of the Gazebo Penguin, it is definitely one of the more durable ones out there. It is certified rust and weather resistant, which ensures it will not fail you down the road. With that said, however, the size does lead to two slight drawbacks of this particular item. As one would expect, the larger layout will take a bit more effort to set up than smaller gazebo models. This is why we recommend at least two people tackle such a project. At the same time, while it is particularly resistant and durable, the large roof does not do well against snowstorms (in areas where applicable) therefore making it not an all season gazebo. While the temptation might be there, we strongly recommend you do not leave it up over the wintertime for it may cause much more hassle than it saves. At the end of the day, the Gazebo Penguin if treated right, is a wonder of luxury and price, making it a true nest for relaxation and indulgence. Last one up in our pick of the best of the best is the Sunjoy Harper Grilling Hardtop Gazebo. This one has some unique features to consider which is why it has made it’s way into our lineup. First things first, it is a very budget friendly hardtop gazebo. While a lot of members of the hardtop world can be fairly pricy, this on stays at a very effective pricepoint. 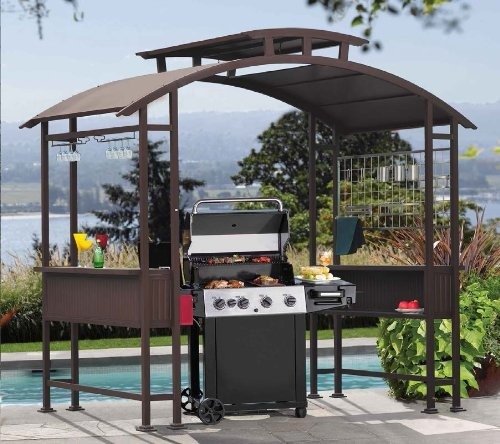 At the same time, you’ll notice in the name that it is a so called “grilling” gazebo, which paves the way to some interesting differences in its build and use. Nevertheless, let’s take a closer look at this hard roof gazebo. 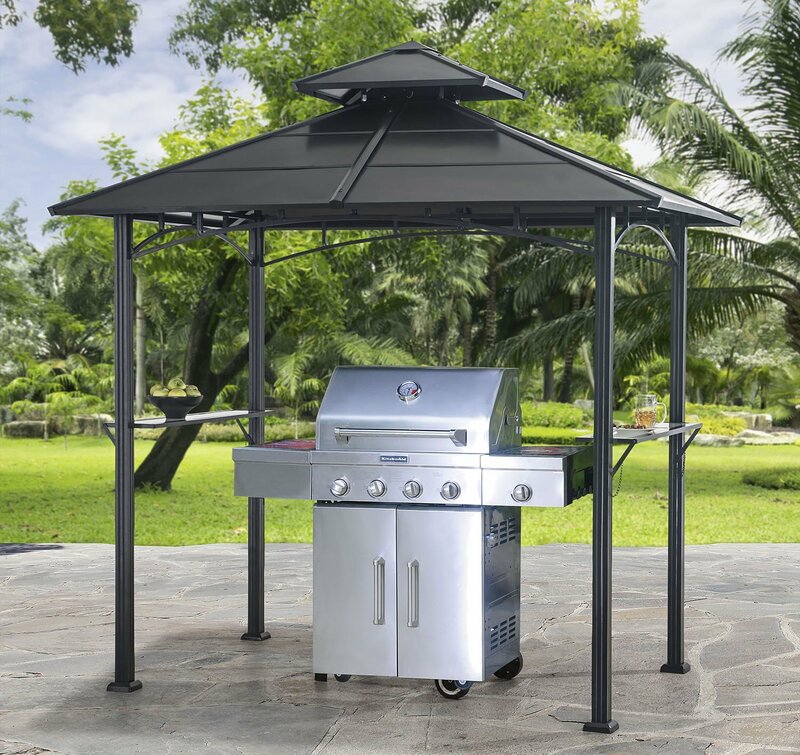 A grilling gazebo, as the name would imply, is typically used to provide shelter from the sun while manning a grill or barbecue. Consider a very hot and sunny summer day. Friends and family are over, the grill is ablaze with delicious food, but someone needs to take matters into their own hands and keep an eye on it. While an important role in entertaining, which carries great honour and responsibility, having to operate the grill during a hot sunny day can be quite exhausting. This is where grilling gazebos come into play. They are the best solution to provide you with some shade while tending to one of the most important tasks of the day. The Harper Grilling Hardtop Gazebo by Sunjoy is especially equipped to cover you when you need it the most. 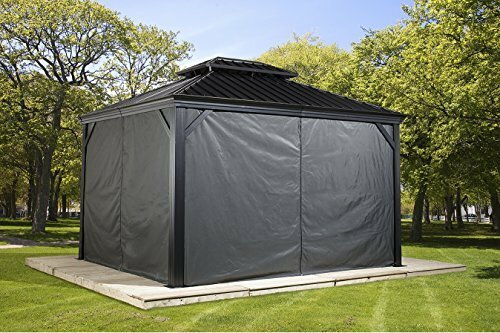 Coming in at a compact 8 by 8.7 feet, it features a non-transparent roof to fully block out the sun, and a well-ventilated design to ensure the smoke escapes and there is proper air circulation to keep you cool. Setting it apart from most gazebos, the Harper actually comes with shelving so that you can set up all of your cooking tools and accessories to be ready right when you need it. At the same time, the small, compact design makes this the absolute easiest and quickest to set up. Truly no hassle! All in all it is perfect for the grillmaster to set up as his own or even to have a friend sit by to keep them company. On one final note, some might be wondering if using a grilling gazebo for regular relaxation and lounging is at all an option. While not a primary purpose, the answer is still a firm yes. In fact, the compact and easy to set up design along with the accessories and pricepoint make it quite an attractive product to consider. The only thing to keep in mind is that you will be working with limited space and limited coverage. It would be best suited for one, possibly two people to recline in fairly close proximity. 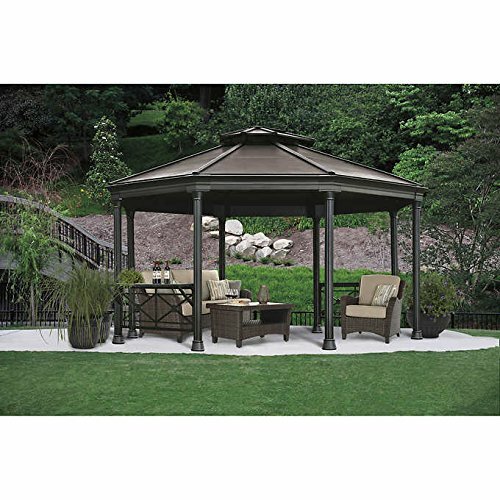 For example, when it comes to all season gazebos, the Fallbrook Octagonal Gazebo from Sunjoy is an elegant outdoor structure. It’ll never have to be taken down just because a few snowflakes hit the ground. The stunning roofline is slanted in a way that the snow will easily slide off on its own with just a slight nudging from you. The height of the roof means that you can find the warmest gas heater and not worry about burning the roof. The structure is a steel and aluminum that’s powder coated to give durability and strength to it. That’s the best for winter because it won’t bow or break under intense cold, snowfall, or windy conditions. You might have to bring in your outdoor furniture during particularly windy days, but you won’t have to collapse the gazebo structure. To further strengthen the frame, the aluminum is shot through with steel bars. It’s an extra step that makes this a winter, all season gazebo. 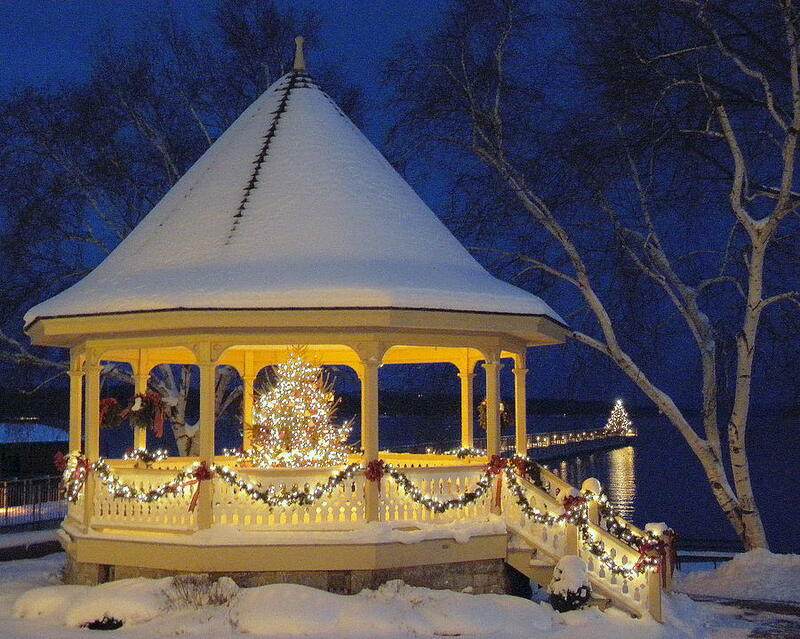 The Fallbrook hardtop gazebo is a winter structure that can be decorated with lights throughout the year, too. Imagine your holiday display with this structure lit up with all your favorite colors. It would be spectacular and the envy of your neighbors. It’s spacious at 16 feet by 14.5 feet, too. 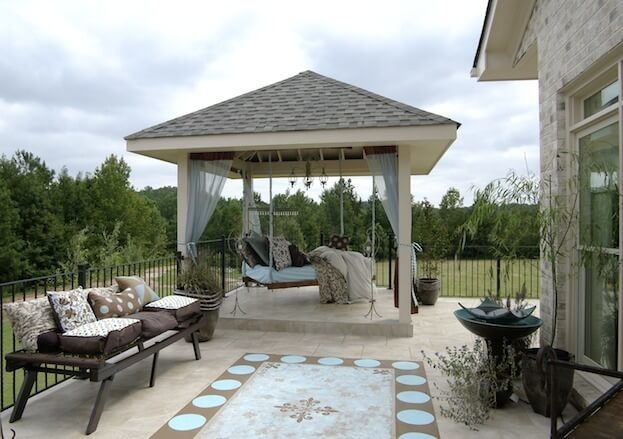 You’ll be able to invite everyone you know over to enjoy the beauty of your gazebo. If you still find yourself wondering what more is out there you should check out our review of the best canvas canopy gazebos. They are a lighter weight and more flexible variety of gazebos. Of course, they come with pros as well as cons, so do read carefully. We’ve included an extensive guide at the beginning of this post talking about the points you need to consider for your gazebo. It applies to all kinds of gazebo types. Whether you want to get a hardtop or a canopy, soft top gazebo, this guide can help you make up your mind. If you need more food for thought, there are more guides for your reading pleasure. 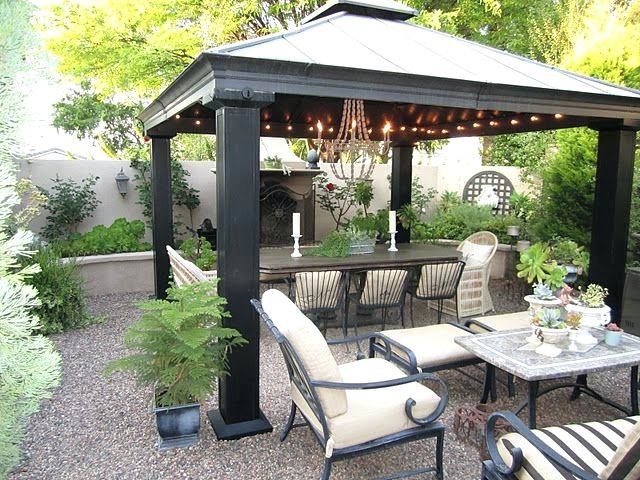 For more information on what to pick out here’s what you need to know about backyard gazebos. Next → Next post: Best 90’s Kids Movies That The Whole Family Will Love!